The inflammatory reaction and destruction of periodontal tissue depend on whether the patient's immune defense is rapid and effective. A poor immune response makes it easier for pathologic processes to take place. Gingivitis is acute or chronic inflammation of the gingiva caused by plaque that only occurs around or in the vicinity of remaining teeth but does not occur in an edentulous mouth (Fig 9-14). Simple marginal gingivitis can be found in nearly every adult. It can remain chronic in a mild form without periodontitis developing. Simple gingivitis is confined to the marginal periodontium above the alveolar bone, while the connective tissue adhesion of the attached gingiva remains intact. Chronic gingivitis results from dental plaque or tartar accompanying poor oral hygiene. It is the most common painless disease of the gingiva, characterized by red and swollen mucosa that bleeds easily as well as bad breath; it can lead to periodontitis. The inflammation can be eliminated by regular oral hygiene and rinsing with astringent solutions. Chronic gingivitis may result from heavy metal poisoning (eg, with bismuth, lead, or mercury) and is characterized by a bluish-purple or bluish-gray gingival margin and even ulcerative mucosal changes. Acute gingivitis in its simple form is mainly associated with febrile systemic diseases; it is characterized by small, painful mucosal swellings with a bright red border and sticky coating. It can develop into necrotizing gingivitis with a gray-brown mucosa and further into ulcerative or aphthous stomatitis. In hyperplastic gingivitis, the gingival tissue proliferates in the interdental spaces and bleeds easily. This disease can be remedied by surgical resection of flaps of gingival tissue. Periodontitis is inflammation of the tissues supporting the teeth in the region of the marginal periodontium. Chronic, profound marginal periodontitis denotes chronic inflammation of the tooth bed with inflamed gingiva that bleeds readily, pus-filled gingival pockets, and root plaque. This results in loosening of the teeth, and the affected teeth may fall out. Acute necrotizing gingivitis, excessive strain on individual teeth (grinding the teeth), tartar deposits, vitamin C deficiency, metabolic diseases, and hormonal disturbances lead to periodontitis. The metabolic products of bacteria in plaque cause increased accumulation of neutrophilic granulocytes in the gingival margin, resulting in inflammatory reactions. The mobile microorganisms penetrate between the tooth and its junctional epithelium into the subgingival space so that a gingival pocket is formed. In the marginal periodontium, acute defensive reactions occur as defense cells collect there. The inflammatory processes destroy the gingival collagen fibers, and the junctional epithelium becomes detached and transforms into pocket epithelium. The treatment of marginal periodontitis first involves removing the inflammation-causing plaque and tartar and then surgically removing the gingival pockets. 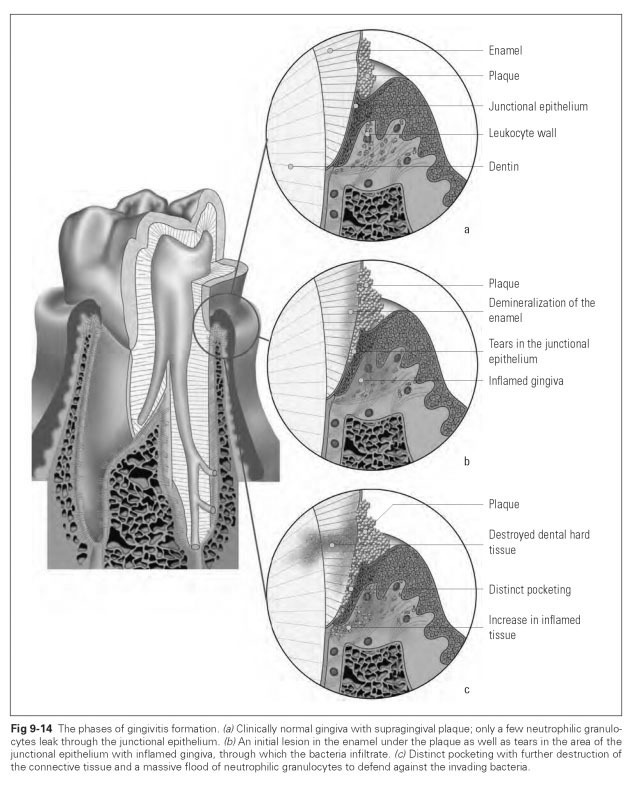 As well as inflammatory diseases of the tooth bed, fibrous gingival hyperplasia may occur, involving the formation of false pockets as a result of mechanical, chemical, or thermal injuries to the gingiva or occlusal overloading. In addition, there are noninflammatory forms of periodontal recession. Acute apical periodontitis is a painless periodontal disease affecting teeth whose pulp is dead. It originates from the root apex and leads to purulent inflammation of the surrounding bony tissue. Periodontosis, unlike periodontitis, progresses without inflammation and pocketing. It arises as atrophy (premature aging) of the tissue anchoring the teeth so that the tooth roots are partly exposed.